Welcome to the 2016 Winter Solstice, the darkest day of the year. We in the Northern Hemisphere are tilted as far away from the sun today as we ever get. In the past, I have dreaded this time of year, the dreary days of winter. Last winter was especially dreary. My husband and I spent all of our time from December to February in a drafty, smelly fixer upper, cold and cheerless. This year, we live in that fixer upper. It’s not drafty or smelly anymore–in fact, we feel it’s quite homey now–but as our first Christmas season in it approached, my feelings about it were kind of dim. After Thanksgiving, I started to look at this big white box of a house and think, “It’s so drab. How can we make look like Christmas?” I didn’t know where to start. We began our advent calendar tradition and pulled all our decorations down from the attic. Boxes of forlorn Christmas garlands and wrinkled red bows spilled over the living room and dining room, but none of it looked merry or bright. It all looked like an uninspired jumble. decorated, the pictures of friends’ beautiful holiday houses on social media flooded my news feed, the weather was cold, and I was a holiday sloth. “Maybe I’ll just hang a wreath and call it done.” I couldn’t find our wreath. But then we put up our Christmas tree. We found a beautiful one at the un-cool location of Home Depot and when we put it up, the lights shining through the deep green branches shed clarity on it all. Light. We put lights up at Christmas because our souls need light in the winter darkness. Two trips to Hobby Lobby later, our front porches had garlands laced with lights and new red, cheerful bows on them. A few days and ten extension cords later, our windows had candles in them to light the night, and sometimes the rainy days. Our advent calendar ornament for that night, when all the lighting up of the house was done, was a candle. This is why stringing up all these unruly strands of lights is worth it and why lights brighten our holiday spirits without fail- The Light of the World came into the darkness. And he stayed and dwelt among us. Christmas lights will come and go, but The Light in the dark days of winter remains. Am I excited about winter now? Not at all. I hate winter. But I’m pulling out all the candles in the candle box I seldom open, and throwing wide curtains on sunny days. As Meg Ryan says in You’ve Got Mail, “It will all shake out. Meanwhile, I am putting up more twinkle lights.” Her friend Birdie calls that “a fine idea,” and it is. 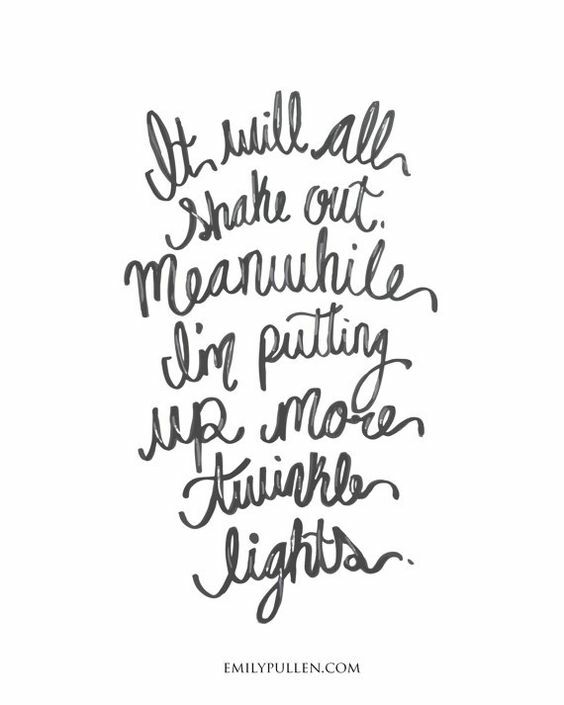 Candles, twinkle lights, lamps in every corner, whatever it takes, we will have light this winter. Light will remind us that the deep darkness in our souls is no more, that The Light has come and He has stayed. May your Christmas and your winter be merry and bright, full of lights and flooded by The Light.